This midi sized unit is a scaled down version of the pro-duplicator. 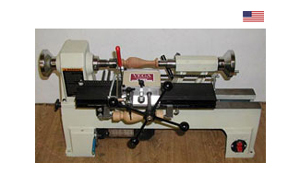 It is perfect for making chess pieces, pens, doll furniture or fishing lures. The carriage has a maximum 10" travel (24"available) and can cut in either direction using the hand wheel. The midi duplicator features a 5/16" high speed steel cutter, chain drive and an aluminum extruded base. It can duplicate from an original turning or template. It will fit lathes with 5"-12" swings making it perfect for the Delta, Jet or other mini lathes. A smaller Diamond Vee Cutter Kit is available for the Midi Duplicator. It offers a replaceable carbide cutter with holder for people doing a lot of work. The Midi Duplicators are only shipped within the 48 Contiguous States. Air Shipping is not available for these items.